I’m not at all a connoisseur of beer. I know a Pilsner Lager is a good beer; Bud Light is not. I know beers from the Czech Republic are among the best in the world. But it wasn’t until I was marinating in a beer barrel in Ostrava, Czech Republic that I really got to experience a good beer up close and personal. A beer massage is one of the de rigueur options offered at the Chateau Zamek-Zábřeh Hotel and Brewery in Ostrava, about a three-hour train ride from Prague. And why not? After all, it washes harmful substances from the body, relieves stress, rejuvenates skin and hair, moisturizes the body and boosts immunity — and you thought it was just to cool off with on a hot summer day! Okay, so personally, I think the claims are a tad grandiose. But then I found out I could also drink the beer while bathing in it. The recommended therapy? Pour a pitcher of light and dark beer replete with a concoction of Brewer’s yeast and selected varieties of hops, malt and peat extract into a bath barrel. Hardly seems enough for the body to get high on. 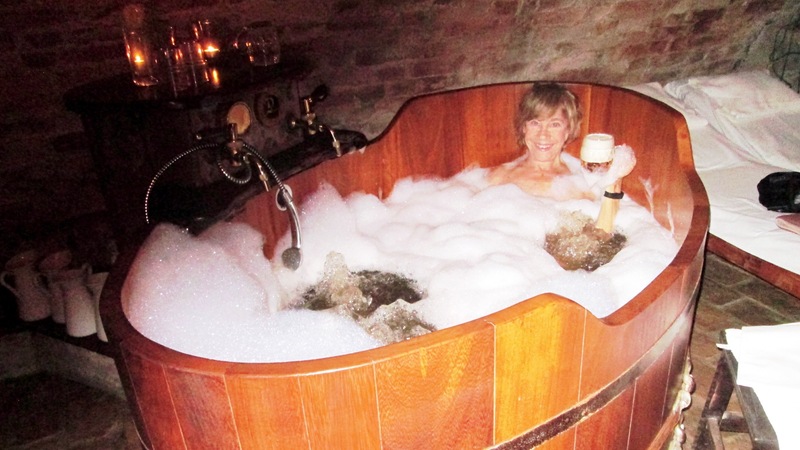 As I submerged myself in the large wooden cask filled with foam bath and filled the beer tankard from a tap attached to the tub, I realized it was the first time the suds in my bath competed with the head on my beer mug. Usually the two are separated by hours. Given the choice, I would rather imbibe the beer than bathe in it. Eventually I had to relent and leave the beer behind in pursuit of less heady adventures. A visit to the Silesian Castle, a 13 th century structure that was rebuilt in the 16th century and then again in 2011, only perpetuated my connection with intoxicating pursuits. A series of gnomes, devils, dybbuks and other fanciful creatures guard the different entrances, a more entertaining approach to a castle than the more usual imposing. Although many parts of the castle have been rebuilt, some parts still hearken back to the 13 th century. Still, I question the presence of so many wooden sculptured caricatures in those medieval times. Or the Museum of Mysteries and Witches, for that matter. Here we have a gloomy underground cave-like chamber filled with large dioramas of fearsome puppet-like figures resembling devils, demons, goblins and witches the size of children in various scary scenarios. Lucifer was there surrounded by bats and skeletons, forming a sort of welcoming committee to hell. And it wasn’t even Halloween! But here’s where my head really began to shake, more from incomprehension than fear. Sharing all these fiendish atmospherics was a fairly impressive aquarium. Just inexplicably taking up space on one wall. Nothing frightening about it. Once again, I’m reminded this is not your grandmother’s medieval castle experience! And similar incongruity followed us to the next attraction — the Mini-Uni Exposition. First thing I saw upon entering was a wall adorned with license plates from every state in the U.S. Why in a Czech exhibition of iconic European architectural structures? Apparently because every year there is a display of classic U.S. cars. Otherwise, no connection. Okay, I’m getting used to Czech anomalies. But what is mesmerizing lies just a few feet beyond — over 30 miniatures of famous European buildings from the Eiffel Tower, Big Ben, Leaning Tower of Pisa to Dutch windmills, the Brandenburg Gate and the Acropolis, all built to a scale of 1:25. At 5’ tall, I usually feel dwarfed by such sightseeing wonders; now I reveled in towering over them! There’s a sense of intimacy not usually associated with viewing such grand architectural achievements! visit despite buildings ranging from the 13th to the 20th centuries interspersed with plentiful park areas and open spaces. 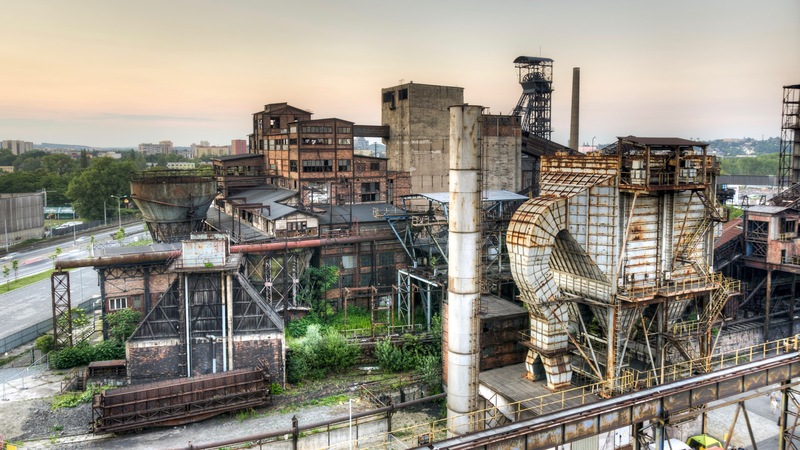 Ostrava is an industrial city by nature — and dominating the city center is a former iron plant that was established in 1828 and closed 170 years later. This humongous series of huge pipes, intersecting steel structures and geometric shapes is the centerpiece of this manufacturing town, but my suggestion? Don’t go there unless you find two-hours of mind-numbing statistics belaboring a litany of iron ore minutia covering measurements, processes and production to be stimulating. My eyes, on the other hand, were glazing over. I was delighted to finally find myself in the Science and Technology Museum, a tad more recent development of 2014, where every interactive exhibit is an exciting visual and tactile experience celebrating civilizations, nature, electricity, people and animals. Rumor has it it takes five hours to do justice to the museum but I could have spent days there and never been bored. 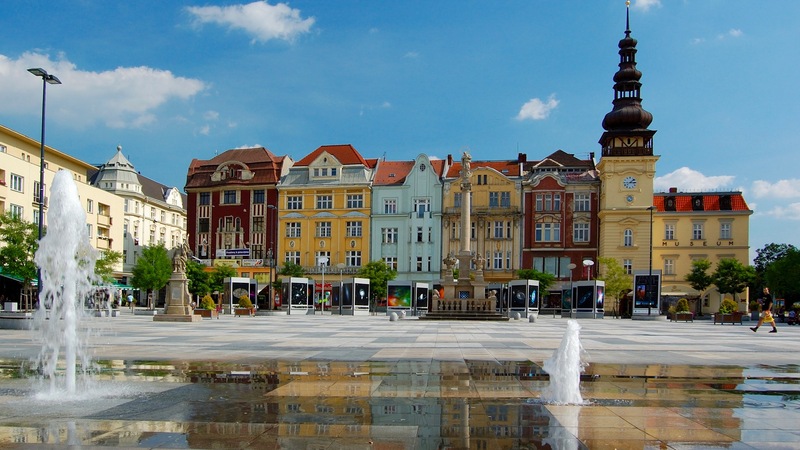 Okay, so Ostrava is not as historical or romantic as Prague, and it doesn’t boast luminous squares full of elaborate castles, ornate monasteries and sumptuous chateaux, with history streaming out over the streets to capture you in the 12th-19th centuries at every turn. But it’s a tourist’s delight in its appealing off-beat attractions and lack of crowds visiting them. It’s a real town where real people live. And its gnomes and beer bath alone are enough to justify a visit. For more information, visit www.ostrava.cz/en/turista. ~ Fyllis Hockman is a multi-award-winning travel journalist who has been traveling and writing for over 30 years — and is still as eager for the next trip as she was for the first. Her articles have appeared in newspapers across the country and websites across the internet.